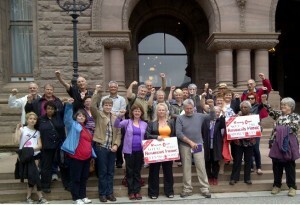 (May 29, 2013)?A bus load of volunteers from Kingston Ontario travelled to Toronto today to deliver 10,000 ballots from a community referendum they held recently to stop the P3 privatization of their community’s new hospital. Almost 10,000 residents voted with 96 per cent opposing the P3 privatization scheme. Kingston’s new hospital is the latest of a slew of privatized P3 hospitals pushed through by the Liberal government, despite promises and rhetoric about protecting public health care.